In recent years, there has been broad and growing consensus among election observation organizations that assessments should be based on “international obligations” or “international standards,” but less clarity as to what these terms comprise or how to determine when they are met. In response, The Carter Center has developed a framework based on public international law in consultation with legal experts and other election observation organizations. This framework is the basis of the Center’s tools for observers, allowing them to link the data they collect to specific commitments made by the host government. The framework is also useful for citizens, electoral management bodies, and other political stakeholders in whose interest it is to advance genuine and democratic electoral processes. Public international law is the system of laws that govern interactions between nation states. Democratic Election Standards are rooted in public international law for several reasons. First, states have obligated themselves to the framework, voluntarily committing through the signature and ratification of treaties to standards of behavior and respect for human rights. Second, public international law provides an objective, transparent, and credible foundation for fostering dialogue and consensus among international election observation organizations on the obligations for genuine democratic elections. Finally, public international law constitutes a living and evolving set of obligations. All democracies should work actively at maintaining and improving their electoral processes. While public international law provides substantial guidance regarding democratic elections, it is not comprehensive. Important electoral issues remain to be addressed. Working with human rights mechanisms to advance new law relevant to elections is a key objective of the DES project. Source documents can be accessed through the EOS database. Through a review of nearly 200 sources of public international law in collaboration with legal and elections experts, The Carter Center has identified 21 fundamental rights and obligations that are relevant to the electoral process. They include those commonly associated with elections, such as the right and opportunity of every citizen to vote, as well as others that are always applicable but assume special significance during an election. 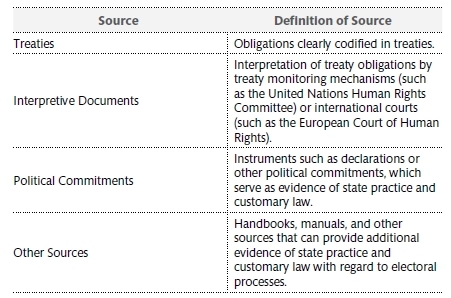 Click on the different obligations in the chart below to go to our Election Obligations and Standards Database and see all of the sources of public international law supporting that obligation. The Carter Center recognizes that an election is much more than election day. It is a cyclical process that unfolds long before and after voting. 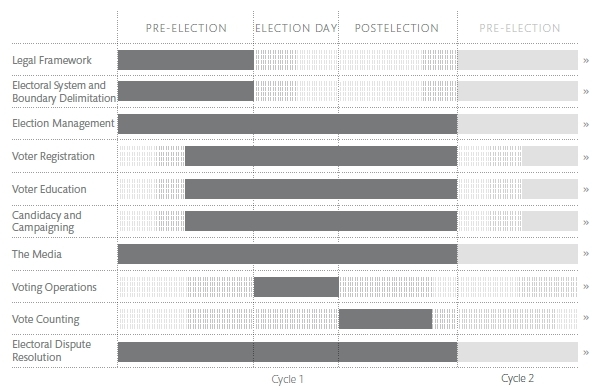 Focusing on elements most relevant to election observation, the Center has identified 10 constituent parts of the electoral process. The obligations outlined above may be relevant to one, some, or all parts of the process. The EOS database and handbook link these two elements together to create an analytical framework for assessment.